What’s the Park Levy about? A 1.8 replacement mill levy has been placed on the ballot for the November 3 election for the Five Rivers MetroParks. The replacement levy would allow the parks to continue to provide clean safe access to nature and recreational facilities for all residents, close to home and free. The levy accounts for 80% of the park system’s operating budget and is the only levy for Five Rivers MetroParks. This issue replaces an existing levy that expires next year. If this replacement issue doesn’t pass before the current levy expires, Five Rivers will lose 80% of its revenue. 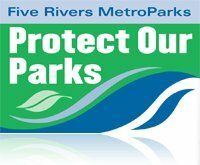 Without that funding, Five Rivers would be effectively unable to operate the parks for public access. We need your help! Our entire campaign must be paid for and run by volunteers. We know times are tough but we are hoping you can spare $10, $20, $50, $100 to help the campaign get the word out. Click here to make a donation to the Five Rivers MetroParks Levy Committee. We also need lots of volunteers! If you would like to volunteer any time at all – from 2 hours to 20 (or more) hours — click here to sign up! Visit campaign headquarters located in the northeast corner of Kettering Tower for more info or to volunteer. Thank you! Let’s work together to protect this community asset. This entry was posted on Sunday, September 13th, 2009 at 11:40 pm	and is filed under read up. You can follow any responses to this entry through the RSS 2.0 feed.